It’s easy to forget how much time we spend in the bathroom when our bathrooms are bland and dull. But trade professionals understand that their homeowner clients want to enjoy the time they spend in the bathroom. At ProSource® of Oklahoma City, you’ll find a fine assortment of bathroom remodeling products that can liven up any bathroom. 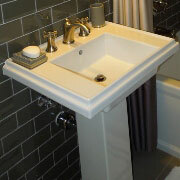 The sink is one of the standout decorative features of any bathroom. At our Oklahoma City showroom, you’ll find under- and above-counter options in a variety of materials, like marble, granite, and porcelain. No one notices the bathroom sink faucet unless it doesn’t match with the rest of the bathroom’s decor. 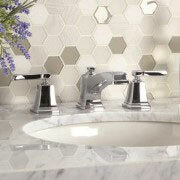 Help your sink and faucet blend harmoniously together with a new faucet from ProSource. 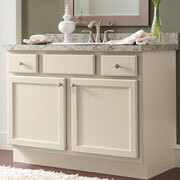 Your clients will love a stylish new fixture in their remodeled bathroom. The shower is part of an everyday ritual for many homeowners. And while it’s already hard to step out of a shower, when trade pros remodel the shower with products from ProSource, they will never want to leave. At our showroom, you’ll find a complete complement of shower doors, handles, heads, and other accessories. Bathrooms are busy spaces, but that doesn’t mean they need to be cluttered ones. If you’re looking to add needed storage space during a bathroom remodeling project, our bathroom design specialists recommend you invest in vanity. They’re an attractive and functional piece for any bathroom. At ProSource, trade pros will find tubs that are high on style and low on price. 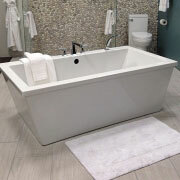 As a large part of any bathroom, our showroom offers tubs in any size and shape and made from materials like marble, porcelain, and fiberglass. 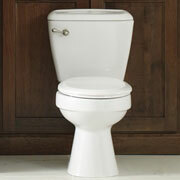 No homeowner wants to fuss with a toilet that has a busted handle or leaks on a regular basis. A new toilet from ProSource can save them water and money. Our specialists can help trade pros find a water-conscious toilet for clients that want their bathroom to be eco-friendly. We proudly serve Oklahoma City, Edmond, Moore, Norman, and Yukon, Oklahoma. The ProSource of Oklahoma City showroom is conveniently located in Oklahoma City, Oklahoma and serves all of the neighboring cities including Agra, Albert, Alex, Amber, Anadarko, Apache, Arcadia, Asher, Bethany, Binger, Bison, Blanchard, Bowlegs, Bradley, Byars, Calumet, Carnegie, Carney, Cashion, Cement, Chandler, Chickasha, Choctaw, Concho, Covington, Coyle, Crescent, Cyril, Davenport, Dibble, Douglas, Dover, Drummond, Eakly, Earlsboro, Edmond, El Reno, Elmore City, Fletcher, Fort Cobb, Geary, Gracemont, Greenfield, Guthrie, Harrah, Hennessey, Hinton, Hitchcock, Hydro, Jones, Kingfisher, Konawa, Langston, Lexington, Lindsay, Lookeba, Loyal, Lucien, Luther, Macomb, Marlow, Marshall, Maud, Maysville, McLoud, Meeker, Meridian, Minco, Mulhall, Mustang, Newalla, Newcastle, Nicoma Park, Ninnekah, Noble, Norman, Okarche, Okeene, Oklahoma City, Omega, Orlando, Paden, Paoli, Pauls Valley, Perkins, Piedmont, Pocasset, Prague, Purcell, Ripley, Rush Springs, Saint Louis, Seminole, Shawnee, Southard, Sparks, Spencer, Sterling, Stillwater, Stratford, Tecumseh, Tryon, Tuttle, Union City, Verden, Wanette, Washington, Watonga, Waukomis, Wayne, Wellston, Wheatland, Wynnewood and Yukon.